Well, probably many readers wonder what happened to Harlem Station since last year. In fact, very little and it was never operated in a decent manner since last summer. However, as this blog can testify, this is often a summer project and I'm actually in the process of makinG some room in my basement to start working again on this great little layout. Among the many tasks to accomplish in the future are some rolling stock upgrade (weight, wheels and couplers) and improving the boxcab performance (LokSound Full Throttle if possible, maybe try the Proto Throttle). Also, a few structures still need to be scratchbuilt and a scenery can be improved a lot. But all that is hardware and cake icing, it doesn't account that much to operation. As we found out during our few operation sessions, this layout as a lot of potential, but can become a real nightmare to stage. There is something alway weird in deciding yourself which cars to pick up or set out. For this reason, I've studied last winter how to create switchlist with JMRI. Creating automated switchlist would boost greatly the impression you are handling freight at a busy terminal and make my life much easier. Until then, we will have to figure out a way to split the layout in two halves again as originally designed. It will require cutting the tracks near the split joint and loosening some scenic material. 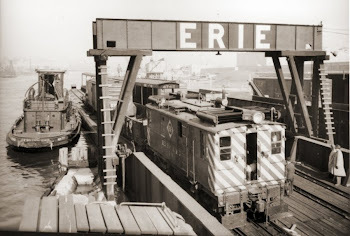 Meanwhile, I added a new link to Ralph Heiss' Lehigh Valley Harbor Terminal Railway blog in the recommended website list. Ralph has been a long time reader of my blog and our interest in railways somewhat overlap.